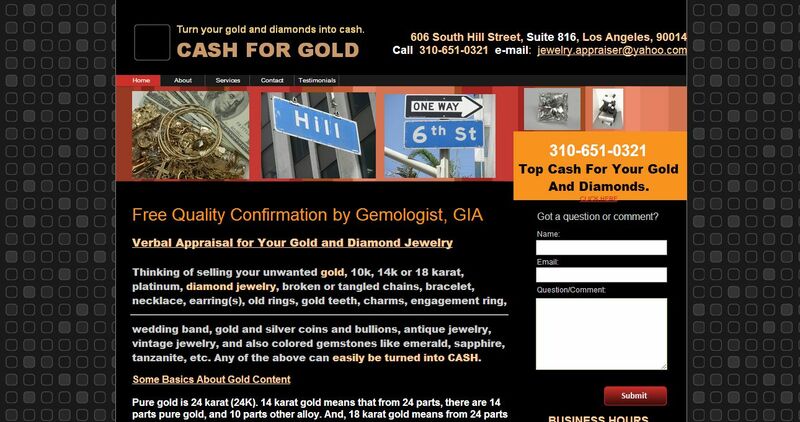 Cash for Gold and Diamond address, phone, website, hours of operation, and more. When we meet, in a few minutes, we will check your jewelry’s gold content, check your diamond(S) for size, approximate weight by gemological weight estimation formula, clarity and color grade of the main stone if any, and average clarity/color grade of accent diamonds, and whether or not we see any sign of synthetic inclusions in colored gemstone. You see everything under microscope. All these services are free. When we walk you to one of the licensed jewelry buyers that is within the same block (in Downtown Los Angeles Jewelry District). These buyers rely on us (gemologists) to make sure the dimaonds are not laser drilled, or fracture filled with diamond powder, etc. In a minute, the jeweler weighs your jewelry and give you immediately a CASH OFFER.